You have arrived at the home page of Bruce Atkinson, successful businessman, world-class poker player and Elvis impersonator. 23/8/14 - Elvis in full regalia at wedding of Sheila and Dennis at Piltdown Golf Club. Someone said "You are better than Elvis" I replied "Yeah-but he's dead". 24/4/14 - Azamara Med.Cruise. Elvis sings every night until poker at 11pm. Can't win much but the drinks are free. 25/1/14 - Burns Night celebrations and Elvis sings "My Love is like a red, red rose" What a riot. 20/10/13 - Elvis-Senior meets "German Elvis" Dirk Holfelder in Germersheim near Frankfurt. Both gave their best performance and lots of fun. 5/10/13 - UKIPT High Roller in London. Bruce cashes $6680. 31/5/13 - GUKPT Portsmouth see Elvis-Senior on YouTube. 28/2/13 - GUKPT London Bruce gets in the money at $3609. 9/7/12 - Short trip to Las Vegas raises $6672. 2/6/12 - LCIPT Brighton 1st place for Bruce and $15666. 7/4/12 - Couple of Bank holiday cashes for $3000. 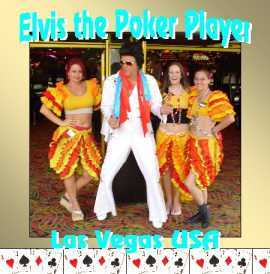 9/1/12 - Elvis gig in Dublin plus poker cash of $1170. 28/8/11 - Back in my home town cashing $3596. 19/5/11 - PKR LIVE in London Bruce cashes $3443. 17/3/11 - Annual Elvis appearance at El Jadida Morocco lasted all week! 11/1/11 - Pokerstars Caribbean Adventure, Bruce Cashes $11800. 28/10/10 - EPT Vienna. 5th Place and $34464. 29/9/10 - UKIPT Grand Final in London - Bruce Cashes $29733. 30/8/10 - Big Win at WPT London, $145024. 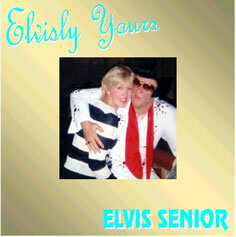 See Elvis Senior on YouTube for 2 interviews. 10/7/10 - Local Poker Tourney - Bruce cashes $4725. 24/2/10 - LATIN AMERICAN POKER TOUR in Uruguay. Bruce cashes $6250 and Elvis does a 60th Birthday Party. 24/10/09 - Elvis swings into action at Charity Event in Mayfair. 20/10/09 - Bruce wins seat for Latin American Poker Tour. 4/10/09 - The European Poker Tour comes to London and Bruce is waiting! Second place for \A364200 is landed after two gruelling days of play. 5/9/09 - Bruce's birthday party in Brighton and guess what - Elvis appears. 16/8/09 - Elvis is in action at The Crown and Anchor, Shoreham by Sea to celebrate "Elvis Day" - 32nd Anniversary of his passing. 11/6/09 - WSOP after 2 days of hard graft, he makes the money again! 3/6/09 - WSOP in Las Vegas, Bruce cashes $4520. 7/12/08 - Meetings in Las Vegas. Discussion with potential sponsors of Ladies Poker Hall of Fame. 1/9/08 - Sponsors sought to promote Hall of Fame tourneys. Promises, but no follow up. 7/7/08 - Caesars Palace, Las Vegas: Bruce wins $5675. 09/08/06 - Bellagio Cup:Bruce makes amends by winning $47375 and 1st place in Cup Tourney. 01/07/06 - Bruce wins seat for WSOP,but gets knocked out in first round! 14/01/06 - Ladbrokes Poker Cruise. 5/01/06 - Mickey Wernick is inducted into The European Poker Players Hall of Fame. 6/01/06 - Eli Marcianno (France) wins the European Poker Players Hall of Fame Classic in Paris (52,150 Euros). 01/12/05 - Tribecca network hold satellites for the European Poker Players Hall of Fame. 06/08/05 - Bruce wins package for Ladbrokes Poker Cruise. 12/02/05 - Devil Fish wins The European Poker Players Hall of Fame Challenge in Paris winning EURO 38,440. 08/01/05 - Bruce performs at Helen Whitwell's 50th birthday party in the Cotswolds which is also the anniversary of ELVIS's birthday. 21/11/04 - Bruce qualifies for 2005 Poker Million by winning a seat on Ladbrokes Raked Hands Freeroll. PLAYERS HALL OF FAME CHALLENGE. 20/08/04- Bruce wins $20,000 in 1 week on Ladbrokespoker.com including the Ladbrokes Poker Cruise on 10/10/04. 9/07/04 - Hall of Famer Donnacha ODea wins Poker Million The Masters 11 live on Skysports. 4/07/04 - Bruce finishes 12th in the European Championship at the Vic. 25/06/04 to 28/06/04- Bruce in full ELVIS regalia at televised World Poker championship in Dublin. Poker Million – The Masters II. Barry Hearn has invited Elvis to appear in the above event. Filming Dates are February 10-13 2004, March 2-5 2004 - First round, Sky Sports Studios, Osterley, West London. See the Poker Million Website. Crown Casino Poker Championships. Melbourne, January 2004. Elvis has been asked to do a gig and play in this event. 30/11/03 Elvis will attend Oxford University and play in the Oxford Cup. Multi gold bracelet winner Phil Helmuth is also coming from USA. 3rd - 9th November 2003. Elvis attended this tournament. It was a tremendous success and many records were broken. On 7-11 just before the final of the big one Elvis dressed up in full regalia and entertained a crowd of over 2000 in the casino. See the Photos. 16/8/03 Elvis appeared at the Grosvenor Casino, Luton. This is the anniversary of Elvis’ death – see press August 2002 for last year’s report. 16/3/03 Poker Million The Masters final live on Sky Television. Bruce joined Jimmy White and Steve Davis in this nail biting event finishing third and collecting $50,000. See Report. 08/12/02 Elvis Senior supports Martlets Hospice, Hove.